Justin, TX (WBAP/KLIF) – A rural dog rescue in Denton County is in need of donations after high winds from Wednesday’s storms 25 damaged kennels and other buildings. Danielle Stewart with Apollo Support and Rescue in Justin told WFAA-TV that they don’t have the 5-thousand dollars needed to for replacements and repairs. 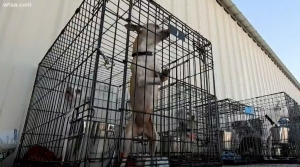 The facility has helped rescue and find homes for thousands of dogs in its 7-year existence in Denton County… with nearly 100 dogs on the property now.